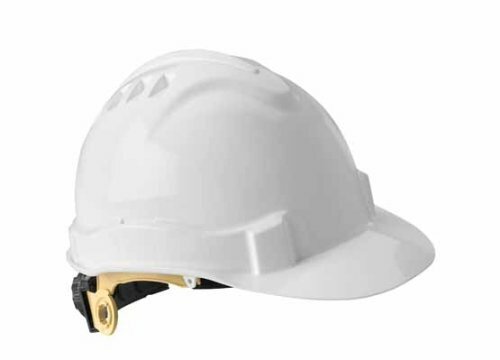 Gateway Safety high-density polyethylene unvented Class E Serpent helmet. Serpent is an ultra-comfortable safety helmet that offers durable head protection for a wide range of work environments. The sleek, attractive style of the Serpent safety helmet will lure you in, but won’t turn you into stone. Serpent protects against the most threatening of hazards, and has been independently tested to meet and exceed the ANSI Z89.1 standard to prove it. It may not turn victims into stone, but Serpent will work powerfully to defend against head injuries. Rotating ratchet adjustment system helps keep the helmet securely in place. Workers will be compelled to keep Serpent on because of its many comfort features, including an eight- point, six-strap suspension, a soft cloth brow pad that absorbs moisture, and an ultra-light weight of just 13 ounces. Provides exceptional electrical insulation for a wide range of environments. If you have any questions about this product by Gateway Safety, contact us by completing and submitting the form below. If you are looking for a specif part number, please include it with your message.